There are so many real stories in the world, a great deal of these not getting the spotlight. 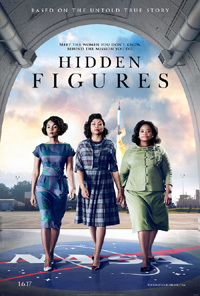 (With Pharrell Williams as one of its producers) Hidden Figures tells the eye-opening true story of Katherine G. Johnson, Dorothy Vaughan and Mary Jackson (three brilliant female African American mathematicians), who in the 1960s played a role in putting John Glenn into orbit - a stunning achievement that restored the nation's confidence, turned around the Space Race, and galvanized the dream that one can reach beyond the stars (or at least as far as the moon). The NASA space programme of the time was very much a white male dominated field, especially in the foreground, garnering the glory while hundreds of essential cogs in the machine silently worked at it, making it possible behind the scenes without public recognition. In patriarchal societies women and their accomplishments still get sidelined in favour of men. While things have improved to an extent (except for cases like equal pay etc. ), it was simply the commonplace way of the world back then. In the case of these ladies some of the indignities they had to endure each day ranged from having to use segregated bathrooms to separate coffee urns, many superior staff looking down on them expecting them to know their place, regularly snubbed when it comes to promotion, both racism and sexism inflicted upon them. This is not however a one-sided morose depiction of injustice, but rather drives towards illustrating triumph under adversity, also acknowledging those who didn't believe in this unfair treatment, and shows how small victories like these chipped away at institutionalized convention to drive towards new progress. The Cold War was also in full swing and with the Russians gaining on the USA, nipping at their heels set on taking the lead, the pressure was truly on. In Hidden Figures the intensive work the ladies did is also contrasted by their lives as regular people with their families at home, away from the work pressure. The three lead actresses deliver believable performances and Costner does what he does best, 'Coster', nothing more nothing less. Where a movie like The Rights Stuff projects the glory and achievement of those who were the faces of the space race, Hidden Figures serves the other side of the coin, looking at the mechanics behind it, and in particular unsung heroes (or in this case heroines) who did their job while still subjected to jaw dropping discrimination. (These two films can make for an interesting double feature, enhancing the perception of both). Whether the recent spate of award-winning and nominated African-American focussed movies got more attention due to the 'Oscars So White' hashtag of last year, or whether the attention drawn to it further fueled movies like this, Fences (Best Supporting Actress win) and Moonlight (Best Picture & Supporting Actor wins) to make it to the screen can be debated, but having seen these, they are legitimate contenders regardless. (Moonlight supporting Actor winner Mahershala Ali is also in this film). Hidden Figures was nominated for Best Picture, Supporting Actress and Adapted Screenplay (but didn't win any of these).